Any kitchen problems can be solved with the use of modern shelves, boxes, and organizers, which are made to order or are sold in ready-made form. Do you have a huge collection of dishes? Kitchen appliances took all the countertops? Is it difficult to immediately find the right jar of spices? With our selection of modern ideas for storing kitchen utensils, you will realize that a large number of things doomed no one to a lack of free space. We present 17 original ideas for the kitchen, which deserved the most recognition in social networks over the past year. And what of this would you choose for yourself? Someone can afford to take a separate room under the pantry, and for someone, the more suitable option is a built-in wardrobe. In any case, a roomy storage room with many individual shelves and drawers allows you to conveniently store products and other kitchen accessories in one place. The original corner drawers are a creative solution for uncomfortable corners in the kitchen. Due to the installation diagonally in the corner, they are deeper than all the other boxes and, therefore, allow you to store more kitchen items. A drawer with 5-6 deep bowls makes it convenient to organize storage of numerous serving items and cutlery. If you can not buy such a special box yet, then keep in mind that it is not difficult to make it yourself or even simply to put stainless steel containers in an empty deep box. A spacious cupboard under the sink sometimes turns into a bottomless pit, so it’s no wonder that many people today prefer this simple solution for him. The drawer allows you to keep all the detergents insight, and in addition, any owner can cope with its installation yourself. Without extra words: it’s incredibly convenient! It is also another option, More ideas for organizing a trash in the kitchen you can see here: ” Ten Tips for Trash“. You can do yourself by adding wooden or metal dividers to any loose shelf, that can be another useful idea for the kitchen. The presence of devices on the countertops often creates a visual mess and reduces the pleasure of cooking. The idea presented in the photo below, allows you to keep a blender, toaster, mixer and other equipment at hand, but at the same time out of sight. Kitchen organizers today are presented simply in a huge assortment: for boxes, shelves, walls and other parts of the kitchen. 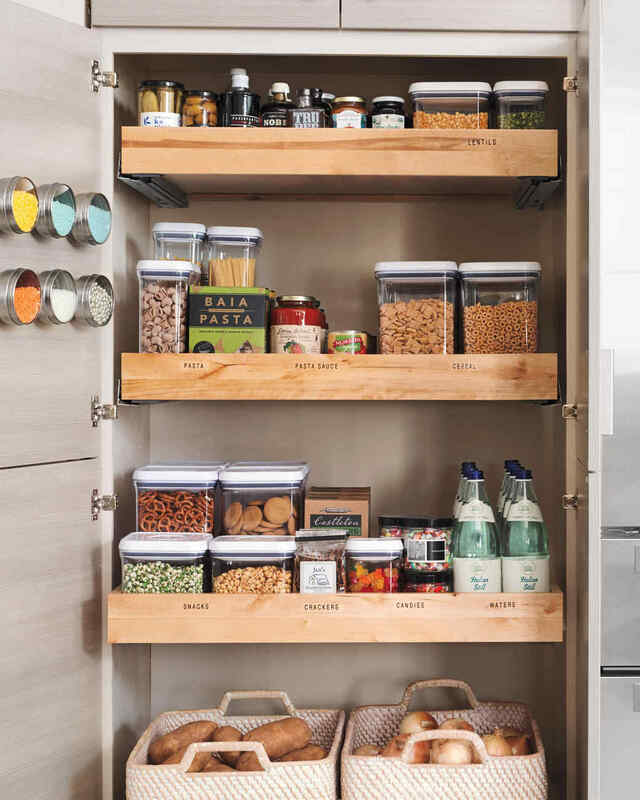 But especially pleasing metal and wooden organizers for the pantry, thanks to which you can store countless items on the doors of the cabinet and inside, keeping it all in an organized form and within easy reach! A remarkable sliding drawer on wheels, among other things, can serve as an “island” in a small kitchen or work as a bar in any other room. Must-have for seasoners and just those of us who sometimes cannot find the right jar on the shelf for a long time! This stunningly roomy deep drawer with adjustable pegs keeps all the plates within reach even for the smallest members of the family. Has it ever happened that a bowl of dog food or water was completely out of place? Then this idea is for you! In addition to a separate shelf for the bowls, the owners of pets often find a place in their kitchen for a cat or dog’s couch. We love these open shelves not only for convenient access to the items standing on them but also for the possibility of a beautiful demonstration of the kitchen decor. The system in the photo below provides easy access to pots and pans, and also works great in uncomfortable corners, as the front tray rises vertically and allows the rear tray to slide deeply to the right. With convenient shelves for bottles, a storage for glasses and a sliding tabletop, this bar can perfectly serve you not only in the kitchen but also in the living room. Easily slips and provides easy access! What else is needed? And now we would very much like to know: what storage idea would (or has already become) a wand for your kitchen? Share the answer in the comments!